The Pile Cage Foot is a two piece product, once assembled, it is used to ensure concrete cover at the bottom of the Reinforcing Pile Cage. The Cage Foot Extention has been designed to extend the cover of 85mm Cage Foot whilst maintaining it's impressive load carrying ability. Manufactured under AS/NZS ISO 9001:2015 guidelines the Pile cage Foot is designed to withstand up to a 500 kilogram dead weight (85mm Cage Foot). - Provides Concrete Cover of 85, 100 or 150mm. - Manufactured from recycled materials. - Simple assembly and push-fit installation. - Suites bar sizes from 20mm to 40mm. - Exceeds AS/NZS 2425:2015 200 kilogram load requirements. *** Total cage weight must not exceed "Number of feet per cage x Load limit", for example 1000 kg cage requires at least 5 x 100mm Cage Feet. *** Higher loads can be achieved by using a 85mm Cage Foot PLUS a 100mm Cage Foot Extension. *** Consideration needs to be given to the possibilty of UNEVEN ground where some Cage Feet may be over loaded. *** Pile Cage Feet and Extensions are injection moulded using Black 100% Recycled Polypropylene. Our contribution to rid the World from plastic waste. The extra wide outer edge, of the Pile Cage Wheel, gives a firm footprint in soft soils. Sturdy wall sections ensure the Wheel provides the correct cover under heavy loads. The Push-Fit mechanism provides quick installation and requires no tools to install the wheel. The cage wheel has a security clip lock, to ensure the wheel stays where you put it. - Provides Concrete Cover of 50mm or 75mm. - Available to comply with AS/NZS 2425:2015 standards. - Suites bar sizes from 10mm to 20mm. *** We stock these sizes, but other sizes may be imported if and when required. *** Pile Cage Wheels are injection moulded using Black 100% Recycled Polypropylene. Our contribution to rid the World from plastic waste. 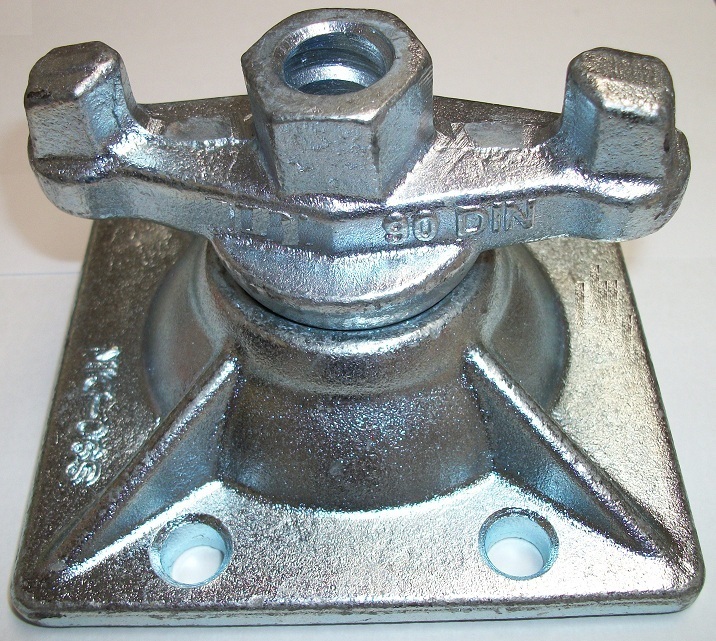 The Push-Fit Mechanism allows the Pile Cage Wheel Spacers to be installed without the need for any tools. This mechanish is the first step in ensuring that the Pile Cage Wheel Spacer remain in place when the Pile Cage is lowered into position. 2. Mobile Rebar Cutter Bender - Powered by own generator. Veja a vasta gama de acessórios para o vergalhão, cofragem e andaimes que fornecemos para as indústrias de construção, vergalhões, cofragem e andaimes.virola Nós estamos fornecendo acessórios para andaimes como ponteira, nozes jack, gota forjada acopladores, braçadeiras, rod, nozes, etc. Bem-vindo a contactar-nos para cotação, obrigado.